Subject:- Grant of Additional pension to the old age pensioners of U.T. Chandigarh which is applicable to Punjab Government employees. Administrator of UT Chandigarh has also adopted the above decision and conveyed it to all Administrative Secretaries/ Heads of Departments/Offices of Chandigarh Administration vide its Finance Department letter No. 65/1/ 34-UTFII (12)- 2012/ 664 dated-18.01.2012 (copy enclosed). DP&PW has also confirmed the same vide their OM No.38/6/18- P&PW (A) dated-18.01.2018 (copy enclosed). 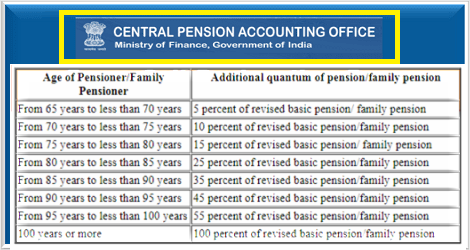 All Heads of CPPCs are advised to ensure payment of additional pensions to the old pensioners of UT, Chandigarh are being made as per slabs indicated at pre-page. This issues with the approval of Chief Controller (Pensions).